Ipoh is now becoming second Penang, there are more and more cafes around Old Town area. This is one that opened recently by my friend, located at Jalan Koo Chong Kong, just somewhere around Nam Heong White Coffee Shop. Cafe De Eight is a cafe that newly opened at Old Town area, which comes with nice ambience, friendly services and nice coffee too. I really like the interior and the exterior of this place. It feels so cozy to be in here. Very cute boards designed by the Boss himself. There are a lot of books available at the book racks, you guys can just borrow the books and read while enjoying your coffee or food. But friendly reminder: remember to return and put it exactly from which column you took the book. Another specialty of this cafe is those beautiful postcards! The boss himself received quite a number of postcards from his customers! He also designed his own postcards and selling at the counter, you can buy from them and they can also help you to post it. There are a lot of cute stamps and colourful pens for you to write your postcards, after writing, you just have to put it under the pocket of the date you wish to post your postcard. One of my favourite shot that taken at De Eight Cafe. I am dare to say that this is the best durian cake I've ever had before. I personally find that the durian cakes in Penang cafes are not so good. All these while I think that Secret Recipe serves the best Durian Cake, but now I found a new place that serves better Durian Cake than them! Tiramisu is also one of my favourite, definitely I will order Tiramisu when I first visit to a cafe. The boss emphasizes that all their cakes are fresh and they try not to kepe them overnight. I myself ordered the caramel macchiato, it was good as I like the bitterness of the coffee in here. I also tried the other 2 drinks too, and the white chocolate mocha is rather unique! I also bought myself a postcard, but I post it back to the boss himself. There are many people who post their postcards through Cafe De Eight too, please don't be busybody, respect other's privacy and do not touch others' postcards. If you are trully a coffee lover, you will know what is this! And yea, they serve Iced Drip here too! Ipoh is getting more like Penang nowadays, there are more and more cafes coming up. After Burps & Giggles, I guess this would be my favourite cafe and I will definitely come back again for my next Ipoh trip. Business in this digital age has become so special and it comes with all forms and types. Now if you need an office for any administration or solely a small office for yourself, SOVO will come in handy for you. SOVO is a new business concept that they provide serviced offices or virtual offices to solve all your business needing. Nowadays there are so many people that starting up their own business with a small modal, and with such small structure, you wont be needing a whole floor or building for you to build your office. This is where SOVO can help you with that. SOVO office suites comes in all sizes, from one person or a group of employees, SOVO can caters to all your need. Currently Tokio Marine rented a big parts of their office. One of their biggest client in Penang. It feels so secured in SOVO because all their doors are sealed with security locks. Even your own office will be lock with security locks that only you can open with the cardkey. One of the office unit that is still available for rent, every office is fully furnished with airconditioner and all the basic furnitures. Saves all your money and renovation fees if you plan to rent an office. There are also balcony for smoking area. There are also a few meeting rooms for you to use, the biggest meeting room can caters up to 30 persons in a meeting room. There will be admin that can help you with all your needs in preparing your meeting room or set up. There are also work stations for rental other than offices. They have plenty of rooms here, most of the rooms are occupied, only partially empty offices still available at the Penang branch. One thing to highlight here is that SOVO do hire admin and help you with all the administration stuffs. Including postage of parcel, receive parcel, arrange shipments and etc. It is totally provided by SOVO, you don't have to pay extra for all these. If you have any clients or you need to meet anyone that come to your office, the front office admin will help you to welcome your guest. There are waiting rooms or public guest room that you can have use to meet your guests. The admin will also help you to serve your guests with coffee or tea too. The space of this place is so big and beautiful. Definitely a good place for you to set up your business or offices. Furthermore, they do provide extra services which are providing you advices or assistants if you are actually new to your business. In SOVO, there will be a networking session that held once in a while for every tenants to do networking or bring in some extra opportunities for your businesses. It is great that you can just have your own offices, but yet you get to meet so many people at the same place. Personally, I would find SOVO a good place for you to set up a small office or for you to start business. Especially if you are doing online businesses, you can actually use SOVO as your virtual office or their services for your needs. On of the biggest advantage if you were to set up your office with SOVO is that you save a lot of cost, where you do not need to rent a big office if you don't need such a big space, and you don't have to hire an assistant or admin to do all your admin jobs. SOVO provide those services depending on the packages that you take with them. Furthermore the networking session would actually help you to open up to more opportunities where you can expand your businesses from here. Another focus: SOVO is not only based in Penang, but there are also branches in KL, Ipoh, PJ and etc. If you would like to go down to KL or other places to meet your clients, you can actually contact SOVO in advanced and borrow their places for meeting. Or you may go to their website for more info. Address: No. 5-1 & 7-1, 1st Floor, Logan Heritage, Union Street, 10200 Georgetown, Penang, Malaysia. There are too many places to chill in Penang, but whenever you come to Gurney Plaza, it's been always those coffee house, or restaurants, and it is getting really boring. Now G Hotel has launched another project called Tree Bar, which is just located next to G Cafe. Tree Bar by G Hotel is a bar that serves imported beers, cocktails, juices, food and snacks that could become a great place for gathering and hangout. Not forget to mention that they are having special promotion of Buy 1 and get 2 FREE before 9:30pm, and Buy 1 get 1 FREE after 9:30pm, terms and conditions applied though. Hoegaarden might be quite common in Penang, but Stella Artois and Lowenbrau is not what you can easily find in other bars or pubs. Connor's is not so common in Penang too. Of course I'm not gonna order juices here right? It is without alcohol, so basically it is just sweet and refreshing. This is my Tequila Sunrise, with alcohol of course. They are at the same price and of course mine tasted better, all because I'm quite an alcoholic! They also serve several types of tidbits for their customers, kinda like this peanut tidbits that coated with some spices. Other than beverages, there are also quite a range of food and snacks served by Tree Bar too. Such as Deep Fried Calamari - RM 22.00 right below, which is one of the best finger food that goes with some chilled beers. What makes it so special is their chef's specialties dips. Served with Sweet chilli dip, kinda into the taste of the chicken wings, it is pretty nice even if you have it without the sauce, it was very crispy too! As you all know, I don't fancy beef at all, so I didn't try this salad, but I keep hearing other bloggers saying that this salad is so nice especially Chloe herself. Guess it must be real good. It comes with chickpea salad and eggplant caponata. I must really say that the lamb skewers are real good! Juicy, tender and tasty as it was grilled with capsicum and onions, though I'm not so into capsicum, but it is good when you have it with the lamb! I love the guacamole here because it is so smooth! But the Pico De Gallo (Something like salsa sauce) was really good too, I find it a bit costly for this 8 pieces of tortilla though. Nicoise salad here served with Tuna slices, making it so special and delicious, what a great combination with some alcohol! It comes with Tartar sauce and Wasabi sauce! What a surprised to taste wasabi sauce in here. It was crispy and fresh, not just the usual fish and chips that you were served out there. I find the portion was a bit small, but it could be the plate is too big though. Just like a burger, but it is with Char Siew Chicken instead of the normal patty. Rather surprised to see Char Siew Chicken served in this way, but it was not bad and the patty was juicy and tender. You will get to choose 2 types of fondue, one is beef and another one is cheese dip, which is the one I had. It is really good to have this bites together with some beers and cocktails though, I like it cheesy and creamy! I guess the chef here really love to play with so many types of dips. This is served with hummus and baba ghanoush, both of them are rather new to me, but I find it quite special and it is just nice to dip with pita bread! One of the best dish of the night! I really like the sauce that filled inside the smoked salmon, it was so creamy and good! Thumbs up and highly recommended! What makes this dish so expensive? Well if you were to hear that the fillings are grilled steak, lobster, mozzarella cheese, tomato & beef bacon bacon lardons with garlic olive aioli, do you still think that it is expensive? I think this is also one of the best bites of the night too, this is perfect to go with alcohol, but one thing troublesome is you have to remove the prawn shells. Chef's homemade Garlic Butter, must have it while it is still hot and crispy! There are also burgers and hotdogs as main course, choices of breads, chips, patty and so on. Looks kinda good, and the portion is not small though, guess it would be good for one person's dinner. I really like the sundried tomato that slipped inside the burger, and also the juicy patty they served. But too bad another type of fries which is Truffle Fries are sold out, cause I heard it is the best fries among the available choices. Overall it was a great place to dine and also a good place to drink. Now I have another place to have gathering with friends. Extras: Anyone who wish to visit Tree Bar will now entitled for something extras! 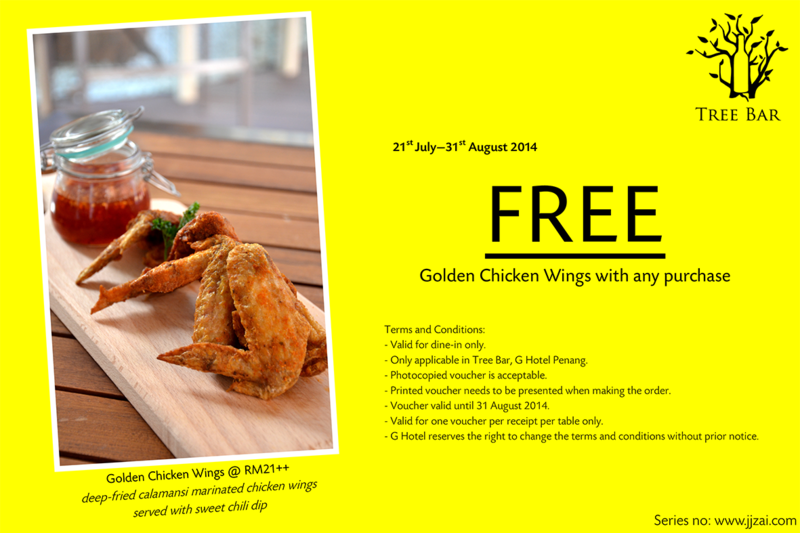 Print out this below voucher and you will entitled for a FREE Golden Chicken Wings with any purchase. Yes! It is with ANY purchase, but please read the T&C before that too. Available date from 21st of July until 31st of August 2014 only. Make a move now and head to Tree Bar before the special promotion ends!